BATON ROUGE, La. (AP) — After decades of planning, officials Wednesday finally began construction of a flood-control canal in Louisiana. NATCHEZ, Miss. (AP) — A Mississippi man has left $2 million to 15 community groups after he died. REEDS LANDING, Minn. (AP) — It was a close call for a teenage driver who escaped serious injury when a boulder rolled down a bluff along the Mississippi River and struck her car. KANSAS CITY, Mo. (AP) — The surging Mississippi River is cresting in the Cape Girardeau area, flooding thousands of acres of farmland. MORGAN CITY, La. (AP) — Residents in six southeastern Louisiana parishes will get some relief from backwater flooding thanks to a new floodgate. ST. PAUL, Minn. (AP) — The economic benefits of preserving and restoring land in the upper Mississippi River's headwaters region nearly outweigh the costs, according to a new study. REPUBLIC, Mo. (AP) — A $4.5 million project is planned to make room for more Civil War-era artifacts at the site of the first major battle west of the Mississippi River. WATERLOO, Iowa (AP) — Closing arguments have been scheduled for Monday in the fourth Iowa trial of an Illinois man accused of killing a 9-year-old girl in 1990. NATCHEZ, Miss. (AP) — The owner of a noted hotel in a Mississippi River town says renovations should resume within 100 days. ST. PAUL, Minn. (AP) — Three Minnesota Democrats plan to join in the flood fight in the Hastings area. ST. PAUL, Minn. (AP) — St. Paul is bracing for spring flooding as the Mississippi River rises with rapidly melting snow. GREENWOOD, Miss. (AP) — A South Carolina meat company is investing $2 million to open a warehouse in Mississippi's Delta region, hiring 20 people. MYRTLE GROVE, La. (AP) — The captain of a tug boat is missing but two crew members were rescued after the vessel capsized in the Mississippi River in Louisiana. 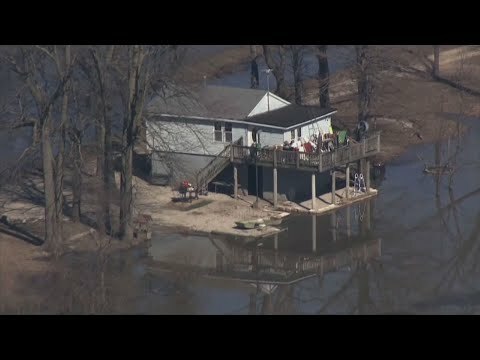 FREEPORT, Ill. (AP) — Residents in northern and western Illinois continue to deal with flooding as rivers swell from melting snow and recent rains. FREEPORT, Ill. (AP) — Rising waters along the Pecatonica and Rock rivers have flooded some homes in northern Illinois cities like Freeport, Rockford and Machesney Park. BATON ROUGE, La. (AP) — The Mississippi River has been closed at Baton Rouge because a towboat sank at the anchorage there. DES MOINES, Iowa (AP) — Texas Democrat Beto O'Rourke is planning a series of stops in Iowa beginning Thursday as he nears an announcement on a 2020 White House bid. KEOKUK, Iowa (AP) — Authorities say coal spilled from rail cars that derailed near Victory Park along the Mississippi River in Keokuk. ROBINSONVILLE, Miss. (AP) — A north Mississippi casino has reopened after county workers built an earthen dike and pumped water off its partially flooded access road. NEW ORLEANS (AP) — The possibility of flooding along the Mississippi River has delayed reconstruction work on New Orleans' famed Bourbon Street. VICKSBURG, Miss. (AP) — A central Mississippi man has been arrested after jumping into the Mississippi River while trying to evade police.